BRUSSELS, Belgium -- Western military alliance expels dozens of suspected Russian spies from NATO headquarters while upgrading emergency military contacts with Moscow. 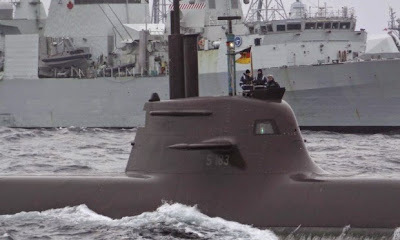 A German submarine takes part in a NATO exercise in the North Sea off Norway. The alliance has been intercepting more Russian planes over the Black, Baltic and Norwegian seas, Stoltenberg said. The western military alliance is reviving cold war-style hotlines to the Kremlin and the Russian general staff in Moscow to reduce the chances of escalating military confrontation and miscalculation as the Ukraine conflict fuels east-west tension. While seeking to boost military contacts with the Russians, NATO has also moved to rid its Brussels headquarters of what are believed to be dozens of Russian spies. In an interview with the Guardian, Jens Stoltenberg, the NATO secretary general, said that as a result of increased Russian air activity the alliance was intercepting more Russian planes over the Black, Baltic and Norwegian seas and that the revival of direct contacts was needed to reduce risk and avoid misunderstandings. “It’s important to have contacts military to military in a normal situation so that if something not normal happens, you’re able to clarify misunderstandings, to avoid situations out of control,” said Stoltenberg, a former Norwegian prime minister. Despite the decision to revive the emergency hotlines, NATO has cut most contacts with the Russians at its headquarters in Brussels and is in the process of emptying the offices of dozens of Russian diplomats and officers. Under a decision taken last month, the size of non-NATO member states’ delegations at the Brussels headquarters has been limited to 30. Russia’s was the sole delegation that numbered more than 30. It is the only country affected by the new ruling, which is being implemented over the rest of this year. NATO diplomats and officials said privately that about half of the Russian delegates were assumed to be working for their country’s intelligence services. Moscow says it had 37 people accredited to NATO headquarters. A NATO member state diplomat said the figure was 61. Other NATO sources put the figure at up to 90. Stoltenberg admitted that he knew of no NATO “partner” country except Russia with a delegation greater than 30, but denied that the measure was targeted specifically at Moscow. “The ceiling is set at 30, which is high and which applies to all delegations,” Stoltenberg said. “It is not aimed at any particular delegation or a particular country. As far as I know, my impression is that this is something that is accepted and is now going to be implemented over some months. Senior officials confirmed that the move was directly aimed at reducing Russian intelligence-gathering at NATO headquarters, adding that only four Russian officials – the ambassador to NATO Alexander Grushko, his deputy, his secretary and his driver – were now allowed to move unescorted at the offices. The bureaucratic moves to curb Russian activities while upgrading emergency military contacts with Moscow reflect the damage done to relations as a result of President Vladimir Putin’s military campaigns in Ukraine and come as Putin used Russia’s Victory Day celebrations marking the defeat of Nazism to stage the biggest Red Square military parade since the collapse of communism. “We, of course, honour the great sacrifices which the people of the Soviet Union paid in the fight against Nazism,” said Stoltenberg. He said that the Minsk agreements negotiated between Putin and the German chancellor, Angela Merkel, establishing a ceasefire in Ukraine and a roadmap to a political settlement of the conflict, were being undermined by Russian violations.